Jenna's Herbs are a big part of our offerings at the farmers market. We have some of the nicest herbs in Rochester. It is our goal to have herbs that will not only grow well, but that you can start harvesting the day you bring them home. We plant our herbs in large jumbo pots so they size up to their maximum potential. We fertilize organically with fish emulsion and compost tea. The best part of shopping at the farmers market is being able to talk to the grower. Jenna has over 8 years of experience growing and using the herbs we sell. The use of herbs in everyday cooking is nearly a lost art. Sure there are wonderful chefs that can dazzle the senses, but the average shopper didn't get a lot of training from parents or grandparents. Jenna spends most of her time on Saturday morning educating her customers both young and old. She has a unique ability and experience with herbs. In the summer our kitchen becomes a laboratory for the development of any recipes and trials of ideas suggested by some of the chefs and customers we serve. 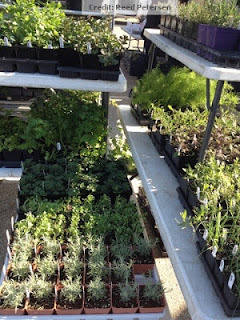 The secret to the best tasting herbs is to grow them organically. If you use chemical fertilizers, you overstimulate and weaken the plants, which in turn causes them to be susceptible to insect damage. The flavor components of the herbs are not fully developed and at their peak unless the plants can grow steadily with nutrients supplied by a symbiotic relationship with the soil. Superb quality, Exceptional value, Organic sustainability, Culinary experience..... Priceless.